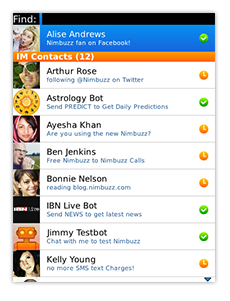 Nimbuzz Messenger for BlackBerry mobile phones has bumped to v1.4.1 with some bug fixes. If you have failed to upgrade Nimbuzz Messenger to the newer version in the recent times, then this update is for you. Some of you have been reporting about Nimbuzz not working after you upgrade to a newer build. In case you face any such issue, try the following steps and you would be able to use Nimbuzz right away! 1. Delete the previous Nimbuzz app. 3. Go to Get.Nimbuzz.com/ BB Appworld and install the new available version.